Reference is drawn to the article titled Coal power here to stay, who says otherwise: published in an English weekly on May 7. In the subject article, the references to “clean coal” and “Japanese Technology” are very misleading. This could be due to ignorance or intention. Recently there have been reports of faked news. Therefore it becomes necessary to set the record straight, particularly in the interests of the consumer and decision makers. The people of this country have an unquestionable right to affordable power. It is a crucial requirement for development – be it of individuals or of commercial activities. It is one of the roads to prosperity. “Light is knowledge, knowledge is light” is a highly regarded truism. Let there be affordable light for everybody for education, learning and industry. Power consumers are paying for inefficiency, lethargy, incompetence, inflated power purchase prices, highly questionable tender awards and just plain robbery by parties with vested interests. This has got to be stopped. Consumers must protest against the shoddy treatment they are subjected to. The protests must be loud, strong and consistent. It is mentioned in the subject article that according to the President of the CEBEU, the CEB’s future vision for coal power plants is for “clean coal plants” utilising “Japanese technology”. It is interesting to note that later in the article he is reported to have correctly referred to these power plants as “so-called clean coal power plants and not just “clean coal plant”. It defeats sane logic to promote large scale coal power. After spending billions of dollars on developing so- called “clean coal technology, the world is abandoning coal power generation because of the massive pollution by carbon dioxide. China, the leader in upgrading boiler technology spent billions of dollars and reached a peak of technology development, built not more than a dozen new plants and abandoned the program in favor of solar power and geothermal power. India too has abandoned coal power and diverted to solar power. Similarly the USA has diverted to solar power and natural gas power; Australia is diverting to solar power and geothermal power, while Europe too, with the exception of Poland, is abandoning coal in favor if wind and solar power. 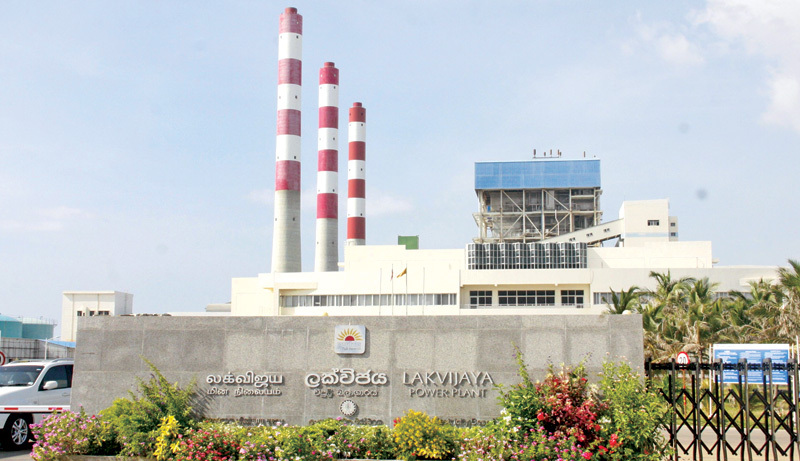 As queried before, what spurious logic is driving Sri Lanka to install more coal powered generation? There is nothing that can be truly called “clean coal technology”. It is a misnomer deliberately made up and used by coal interests on the attempts by governments in the recent past to clean up coal fired power generation by eliminating pollution, improving thermal efficiency and effecting carbon dioxide sequestration. Of these three branches of supposedly “clean coal technology”, only thermal efficiency improvement has been achieved. This only reduces carbon dioxide pollution by about 25%. Coal is not cleaned of its impurities before burning; as such pollutants like SOx, NOx, heavy metal minerals and radionucliides are still there. It has been made mandatory to remove SOx, NOx and mercury and fine flue gas particulates, but most operators do not comply because of losses. China has required all coal - fired power plants to be retrofitted with emissions reduction technologies over the last six years. This is something Australia has studiously avoided doing. As a result, Australia has the most emissions intensive coal - fired power generation fleet in the world, behind even India. The third branch of Carbon dioxide sequestration is non-existent. Coal is dirty from the moment it is dug up. Mining destroys the environment. In some places such as in Applachia in the USA, whole mountain tops are just dynamited off to expose coal veins. The ecology of the whole mountain is destroyed. In other places with surface coal, huge pits are dug up; in these, massive coal mining machinery and dump trucks look like small ants in an ant hill. In still other places huge horizontal and vertical shafts are tunneled to mine underground coal seams. Excavations and coal-mixed backfill damage the environment. Exhausted and abandoned mines covered up by coal wastes and earthfill take generations to recover as shrubland. They are useless for agriculture. Until the cover-up, the mining areas are full of coal and dust pollution. “Black Lung” is still a fatal disease for coal workers. The mined coal is washed prior to transport. This results in about 10%-20% as waste in the form of coal powder. That is directed with washwater into huge depressions in the ground. In one particular pit in Pennsylvania the amount of waste coal powder is 7 million tons. They, in hundreds of thousands all over the world, are all pits of serious pollution. The washed coal is stored near the washing plant, in railway yards and shipping ports. At each point there is coal dust pollution on a massive scale considering that coal transport is in terms of several million tons annually. Handling at each such point and at delivery points and power plant coal yards create new coal dust – creating hazards in those areas too. At coal fired power plants the coal yard could be several hundred acres in extent to permit thin stacking so as to reduce the danger of spontaneous fire as far as possible. The coal is exposed to the sun and rain. Coal dust is produced and it is washed down by rain. In ten to fifteen years the run-off leaches into ground water. Coal contains traces of heavy metals which are toxic. We import and store over two million tons of coal annually. Over the long term as toxic material from coal dust and combustion residues collect in the ground and groundwater, the level of toxicity will exceed the levels safely tolerable by animals and plants. Animals here include humans. Sri Lanka will be certainly affected by this pollution. That is showing now. Our country has a very limited land extent and too heavy a population density. We do not have land to waste – not even a hundred acres. Even now national parks, sanctuaries and animal habitats are being invaded and destroyed by humans. Coal is burned to obtain heat and the heat is used to raise steam to drive turbines. Coal is not cleaned before burning. It is only pulverized to a particular size. There is no change in this practice so far in the so-called “clean coal technology”. To make it doubly clear, coal is used in a mere pulverized state in sub-critical boilers as in Norochcholai as well as in advanced ultra super-critical boilers as in China. In burning coal, about 65% of its energy content is wasted as heat – until recently. Now, with advanced ultra supercritical boilers, this wastage has been cut to 45%. Even so, the waste is very high. In short, we are wasting roughly 50% of energy from a limited domestic resource. In the case of solar, we use only about 16%-20% but the resource is unlimited and external. In solar power, the resource is eternal and unlimited. Waste is not a concern and is unavoidable. Mention is made of introducing “Japanese Technology” in coal power generation. What is this technology? The only new technologies applied in commercial scale to coal power generation is supercritical boiler technology and multi-stage turbine operation. The former was probably started in the USA a couple of decades ago but not seriously pursued there. Japan developed the technology to some extent but the greatest development has been in China. In all boilers high heat is applied to convert water to steam at high pressure. This steam is used to drive turbine-generator sets. In the recent past boilers were operated below the supercritical temperature and pressure of water which are the conditions under which water as liquid is in equilibrium with water as steam and changes from one state to the other without gain or loss of heat. Such boilers are called sub-critical. The boilers at Norochcholai are sub-critical. The thermal efficiency of a boiler is the percentage of heat energy that is converted to usable energy. For sub-critical boilers it is around 33% to 37% depending on age and usage. Super-critical boilers have an efficiency of about 40% - 45%; ultra super-critical boilers have an efficiency of about 45% - 50% and advanced ultra supercritical boilers have an efficiency of 50% - 55%. Only the Chinese have built operating advanced ultra supercritical boilers. This increase in efficiency only ensures better conversion of heat energy to usable energy; in other words a better use of coal, or in less use of coal to generate a given amount of energy. It has nothing to do with clean coal. The coal used is not cleaned; it is only pulverized as it has been used in sub-critical boilers. However, the reduced use of coal is said to reduce pollutant emissions by about 25% - which is a big plus point. To ensure economic viability in supercritical technology, the boilers and the generators have to be huge. They have to be hung from an expensive steel framework as the only way to allow for their massive expansion at the high temperatures and pressures they are operated at. In addition, they have to be made of more expensive newly developed special alloys to withstand the operational conditions. The generators too are huge. Based on efficiency considerations, the generators generally used are of 660 MW capacity. In these, the rotor alone weighs over 6,000 Tons. They have to be rotated at speeds of 3000 RPM to produce 50 Hz cycle current and at 3600 RPM for 60 Hz cycle current. To rotate at least two such rotors at over 3000 revolutions per minute [RPM] a huge source of power is required – like a nuclear power station of over 1000 MW. That is another reason why this new boiler technology has to be applied in power plants of more than 1000 MW, apart from economics of scale. In China advanced ultra supercritical technology has been applied at a cost of about US$ 600,000 per Mega Watt as reported by the senior engineer in charge of a project. Outside China this cost is estimated to double to about US$1,250,000 per Mega Watt. To work at least two generators each of 660 MW, the power plant capacity should be a minimum of 1,250 MW, costing a total of over US$ 1.5 Billion. In fact, two Japanese companies are building a 2000 MW ultra-supercritical plant for a private Indonesian coal company at a reported cost of US$ 4 Billion. Because of the cost, each Japanese company is taking up only 30-35% equity and the Indonesian company is taking up the balance 35% through the supply of fuel. They have the support of non-recourse loans too. The coal company is already in trouble and may have to be bailed out by their government. Can we afford such expenditure on coal power as promoted by the CBEEU? Not at all likely. In addition, and apart from the cost, in a country like ours with a comparatively low power demand and a matching small power supply system, it is not practical to have 1,000 MW power plants. The sudden loss of power from such a plant, for whatever reason, will mean a black out or a brown out for about 25% to 30% of our consumers. Such a power loss cannot be easily met as emergency supplies. That would require 500-1000 MW instantly, seamlessly available emergency capacity – capacity which would be normally idling. Can we afford that too? No!. It will be simply be a non-productive burden of expensive equipment and manpower. Many coal producing countries are cutting down firmly on coal production and use. In the future coal prices will rise, definitely due to transport and manpower costs, if not for reducing supplies. Then we will be burdened with a huge ever-rising recurrent expenditure, magnified more than now by corruption. Therefore, considering all the negative factors connected to the use of coal for generation of power, why is it being so religiously promoted by the CEBEU when there are other much cheaper, much cleaner and more sustainable methods of power generation? This gives a lot of food for thought, with high concern. SOLAR POWER COSTS ARE SINKING! Panel costs are coming down substantially. Chinese products are not the cheapest. The second biggest installer and utility scale operator in the USA is planning to give fixed tilt solar power at less than US Cents 75 per Watt by 2020. First Solar, the biggest panel manufacturer in the USA, will be “under $1.00 per watt fully installed on a tracker in the western United States by 2017”. They are producing panels for as little as 40 cents a watt, or about 15 percent less than China’s biggest manufacturer Trina Solar Ltd. In 2019, First Solar’s module cost could be as low as 25 cents a watt, according to analysts’ models. With the availability of cheap solar power generation components in price ranges of just a few hundreds of dollars, why hanker after coal powered plants costing billions of dollars? At present conventional commercial multi-crystalline polysilicon solar panels made by Solar City and Panasonic the highest efficiency rating of 22.5%. Thin film Cadmium Telluride panels made by First Solar have a highest efficiency of 22.1%. Further improvements will come, no doubt. By end of next year, if tests for lifetime preservation of certain materials give positive trial results, the efficiency of all solar cells, installed and to be installed can be improved up to 32% to 45% by means of a simple operation. This will make a huge impact. Within the next 5 years, the efficiency of panels alone could be improved to about 55% simply by making use of the invisible light and reflected light now wasted. In addition, the heat produced will be conducted away and stored – for power production at night. Several start-up companies are very confidently spending millions of dollars each on these developments. In the face of all these improvements and price reductions, who would want coal power? If the answer then is that coal power generation will be required to maintain base load power, the solution is micronized coal power using low-sulphur coal. Micronized coal, ground much finer than pulverized coal, can be easily separated from pollutants that contain sulphur, nitrogen, heavy metals and radioactive materials by a simple gravitational separation. It is then a true “clean coal”. As a result, flue gas desulphurization and removal of mercury will not be necessary. These plant being in the range of 50-100 MW, are easy on the finances and can be strategically located in relation to the grid. The effects of tripping of one or two units can be easily absorbed by the grid system without affecting consumers. Alternatively solar power can be stored in batteries and released for peaking. Storage batteries are coming down in price. The Flow Battery could be an affordable solution. 1. Coal extraction takes up a lot of capital and other inputs. Sunlight comes free. 2. Coal power plants, even those of the latest technologies, emit a lot of pollution that imparts toxicity to the environment and affects the climate. Solar power plants do not emit any pollution; nor do they affect the environment or the climate. 3. Coal power plants are expensive to erect, expensive to operate and need long-term fuel stocks. Solar power plants are much cheaper, with virtually no operating costs or fuel inputs. 4. Coal power plant maintenance is occasionally very complex, expensive and loss-making. In solar power plants every part, be it panels, inverters etc can be monitored and problems easily detected “on line”. Parts or units are small, cheap and easily and quickly replaceable. No back-up power is required until repairs are done. 5. Coal power plants are necessarily large and unaffordable. They are not suitable for small countries too because a tripped plant can wipe out the power supply to 25% to 30% of consumer for several days. Solar power plants are affordable, can be built and extended as funds permit and contribute greatly to successful distribution of power. 6. With coal power we are wasting roughly 50% of energy from a limited domestic resource. In the case of solar, we use only about 16%-20% but the resource is unlimited and external. 7. Coal power generation produces massive quantities of gaseous and solid wastes which are harmful and not disposable. Solar power generation does not produce pollutants or residues. From the foregoing, power consumers must be realize and keep in mind that solar power is about the cheapest, the safest, the most reliable and the most sustainable energy form available to us. In a few years a very much more convenient method of power generation might become available. It will give steady “base load” power day and night. Tests have been going on for nearly two years to remove “bugs” in the generator. Till that is done successfully, power generated from solar energy remains the best option.